Black spot is a common fungal plant disease that develops from leaf wetness, high humidity and plant overcrowding. 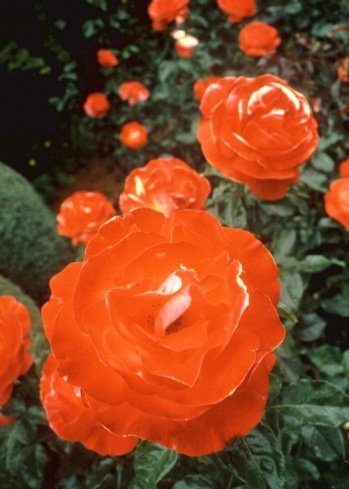 Roses are particularly susceptible to this blight, which causes black spots to appear on leaves. If left untreated, foliage will eventually fall off and the plant will become increasingly less healthy. Infected leaves must be removed immediately and the plant treated with either a chemical or organic fungicide. If left untreated, infected leaves or stems can survive through winter to infect next season's growth. With the movement to organic gardening gaining steam many people are now looking to natural remedies for pest and fungal diseases of plants. Black spot is one blight that responds particularly well to an organic approach. There are several natural home remedies that can be whipped up using mostly common kitchen ingredients such as baking soda, dish liquid and cooking oil. Two slightly different recipes to fight black spot are listed below. Combine 1 teaspoon of baking soda and a few drops of dishwashing liquid with 1 quart of water in a spray bottle. You can also add a half teaspoon of horticultural oil, such as Sunspray Dormant Oil, to increase effectiveness against black spot and other fungal diseases. Horticultural oil can be found in most garden shops. Be sure to shake the container well before spraying. Add 1 tablespoon of baking soda plus 2 tablespoons of white oil to 10 liters of water. Mix thoroughly, making sure the baking soda is completely dissolved, before applying. Before applying your black spot home remedy, first rinse off the plant's foliage to remove any debris and let the leaves dry completely. In early evening, spray plant foliage and surrounding soil with your remedy. Remember to shake or mix your treatment first so that it is properly blended. Do not spray in full sunlight or during the heat of the day as foliage can burn under these conditions. Repeat applications every 7-14 days or as necessary.